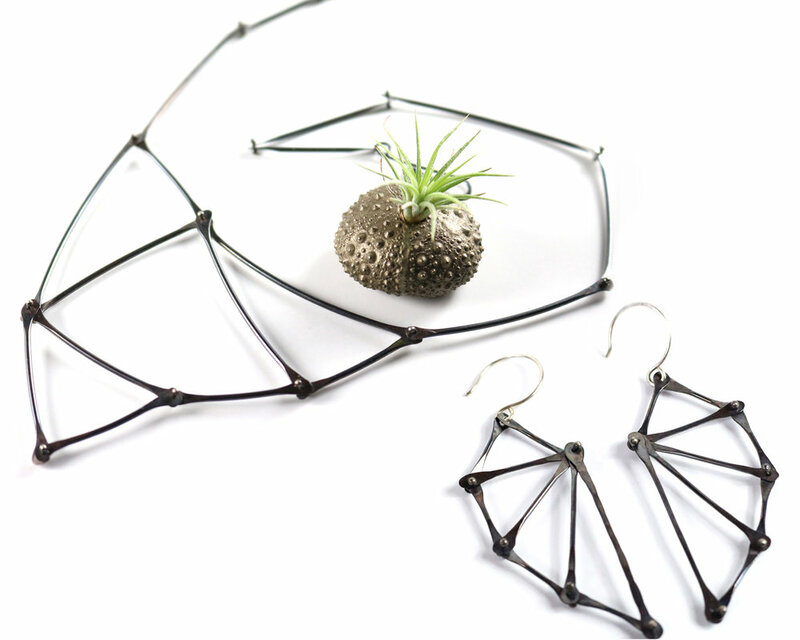 A celebrated jeweler working out of Asheville North Carolina, Olivia de Soria creates art-jewelry with a sculptural flare. An undergraduate of Virginia Commonwealth University, Olivia received a BFA in the metal-smithing program. Years of technical training and conceptual development lit the fire of Olivia’s career as a contemporary jewelry. The spark of that passion started much earlier however, when Olivia was eleven years old, old enough to tear apart aluminum cans and hammer away at them until a wearable pendant was born. By reconstituting objects that surround us in the natural and industrial world, Olivia reshapes our environment through her imagination to beget wearable art. Sensuality is the embodiment of her designs which adorn the feminine figure with distinguished style and grace. Olivia’s design process has been extensively influenced by cultural traditions from all over the world. She spent six months in the Persian Gulf doing field research on the history of pearl diving. Olivia fully immersed herself in the culture in order to study an almost forgotten history of one of the most interesting and dangerous trades imaginable. All of her research and photographs can be seen at www.desoriadesign.blogspot.com. Her unique experience transformed her eye for pearls. Olivia’s unique and contemporary pearl designs are a direct effect from her first hand experience in a pearl diving country. For more information about us please visit our blog.